"Angel Dust" (1992) is the strongest and most frighteningly adventurous of all of Faith No More's works. They take the twisted pop sensibility of their previous album "The Real Thing" and distort it to no end. It's still accessible, but it is the audio equivalent of being stuck in a macabre house of mirrors from which you cannot escape. I love it. 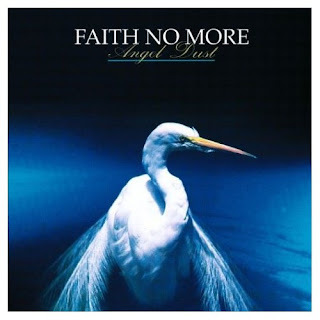 Vocalist Mike Patton definitely combines his knack for the strange, morbid and unexpected from his other band Mr.Bungle with the exceptional musicianship already present in Faith No More to create a disturbing masterpiece of metal/country/funk/soul/noise/call it what you will. So without further ado, let's make our away into the warped world of "Angel Dust". First of all this album is visually about opposites and conflicting emotions. On the front cover we have a beautiful picture of a heron...but on the inside artwork we have gruesome and gory images from a slaughterhouse. This conflicting feeling of beauty and ugliness ties in perfectly with the music. We have Mike Patton's smooth as silk vocals and some beautiful keyboards giving an illusion of serene beauty. But what lies underneath? The guitar work is ugly and gritty and the production is very thick and overwhelming. Also, Patton's vocals tend to explode without notice, offering extreme unexpected, psychotic mood swings. This leaves you uncomfortable and on edge, as you do not know what to expect next. The lyrics are depressive, twisted, ironic slices of reality. Cynical and macabre...at first glance they seem joyful but they really reach into the depths of despair, loneliness, and madness. "Angel Dust" just keeps geting better. It continues with plenty of first rate ugly pop gems such as 'Kindergarten'. The last half of the album is especially disturbing. 'Malpractice' is a face removing nightmarish blast of noise..then there's the snotty, 1970's funk chant 'Be Aggressive'. I love the ending of this album. It starts with the extremely hellish 'Jizzlobber' that will make you want to come to Jesus, followed by the serene, beautiful and completely serious cover of the theme from 'Midnight Cowboy'. Breathtaking and shuddering at the same time. I highly recommend "Angel Dust". As I said, it is Faith No More's strongest work. It is a work of beautiful ugliness powered by opposites...it is the stuff nightmares and dreams are made of. This disc never seizes to amaze.